Thanks renee for requesting this recipe! Even though I mentioned how much I loved these, I didn’t even ask for the recipe myself! So now we both have the recipe! Thanks to my co-worker Arleen for sharing it! Salt zucchini. Drain in colander 10-15 min. Mix all ingredients together. Place in greased 9×13 pan. Bake at 350 degrees for 30-40 mins. or until lightly browned. Cut into squares. 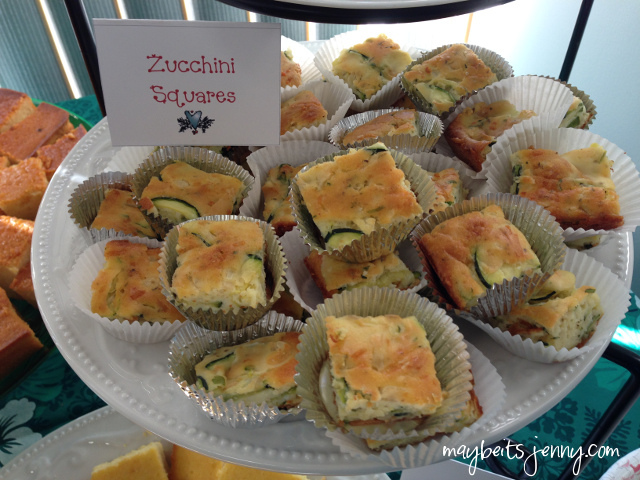 This entry was posted in Food, Recipe and tagged Bake, Zucchini Squares. So interesting! And I love the cute sign! Thanks Jalna! The recipe was super good, I ate my fair share…! You’re welcome! I hope it turns out well!